Retention Letter to Parents & Counselor Organizer - UPDATED!! Writing letters home to parents about their child's academic failure is a struggle. This form letter is written in non-threatening language that is highly informative to parents. 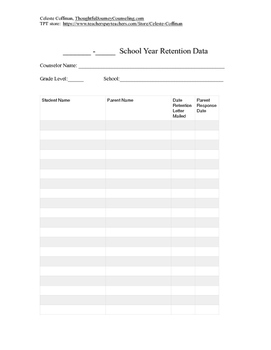 It allows space to write in the grades/subjects of concern, as well as a portion for parents to sign and return. * An organizer to help you track your efforts to contact parents and their responses back to you - ideal for keeping documentation in case of litigation!! Please note that you are purchasing a product for your own use. If another staff member of your organization desires to use this product, you may purchase an additional license for half price.